Many theaters in New York City and New Jersey began as live performance theaters, and when vaudeville was on the decline, conversion into movie theaters became a more profitable option. But maintaining these grand film palaces was expensive and proved difficult to keep operational. 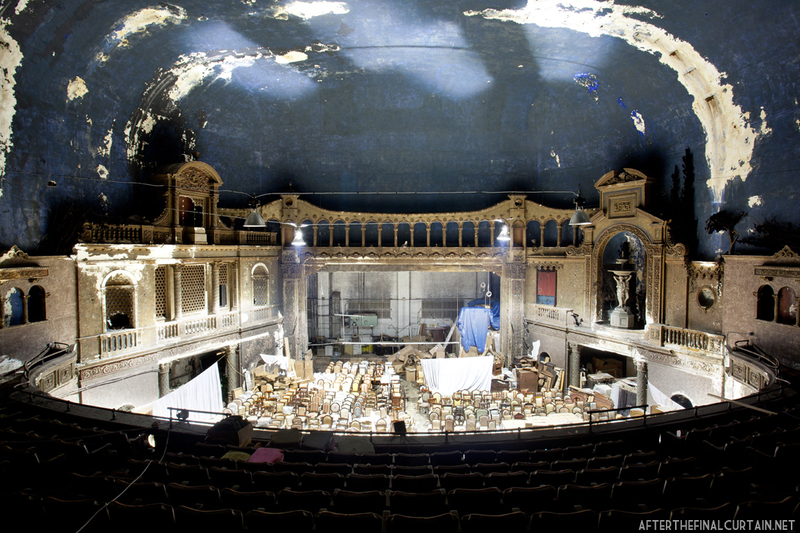 We bring you now 10 movie theaters in the New York City area that have stood abandoned for decades, falling into disarray as they became nothing more than warehouse spaces and retail store fronts. The main floor of the auditorium is now used as storage for a furniture store. Located in Borough Park, Brooklyn, the Loew’s 46th St. Theatre was a movie palace that went through a few different cycles in its life from 1927 to 1973. It opened as the Universal Theater on October 9, 1927 to a huge, disorderly crowd of 25,000 people waiting for a spot in the 3,000-seat theater. Many even resorted to sitting on the fire escapes just to get a look at the beautiful interior. Designed by renowned theater architect John Eberson, it was New York’s first “atmospheric theater.” Eberson’s design tried to emulate a starry, night sky over an Italian garden. Decorated with painted gold and a blue dome, the theater felt like an open-air auditorium with twinkling stars and other “atmospheric effects” being projected onto it. The rise of multiplex cinema in the ’60s caused the theater to fall into hard times and became a music venue, briefly becoming known as the “Brooklyn Rock Palace” where acts like the Grateful Dead, Jefferson Airplane, and the Byrds performed. The theater has been closed since 1973, following community pressure regarding noise levels. The year after, it was sold to a furniture company whereupon significant changes were made on the interior, including the removal of the stage. The auditorium became a storage area for the furniture business, while the lobby became a show room.